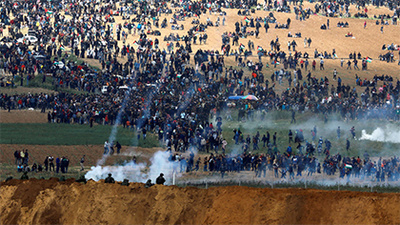 Gaza is organizing large marches and trying to cross to Israel. The reasons behind the marches are multidimensional, as they are both attempts at protesting the withdrawal of financial aid and an attempt at distracting the IDF while trying to infiltrate from elsewhere, while attempting to give credit to Hamas which is losing credit among Palestinian populations. Here are ten things you need to know about the situation. Yep. I've heard some media outlets hint that Gaza was occupied by Israeli forces. Gaza is an autonomous region with no Israeli settlers or military presence. It is self-governing, and hasn't done a heck of a job at self-government. If you're in Gaza, criticizing Hamas could get you in trouble. But you can criticize Israel all you want. Gaza gets a lot of financial aid, which it uses to stockpile weapons and pay pensions to the families of “martyrs” that is those who died or are in prison and committed acts of terrorism. As for those schools, hospitals, industrial bases or banks, no one needs those. Golda Meir once said that there was no such thing as the Palestinians. She had a point, because until 1968, the plan was technically and ambiguously to return the West Bank to Jordan and perhaps Syria and Lebanon and to return Gaza to Egypt. There were no talks of a Palestinian state until 1968. But despite the existence of an Israeli state since 1948, Hamas does not recognize it. And since 1968, few Israelis would deny the existence of a Palestinian people. If you're Palestinian and you kill Israelis, your family will get pensions. I've rarely heard any government call Palestinians for restraint on that one. There have been cases of IDF soldiers who ended up in prison for confusing the IDF with a game of half-life or something. At the IDF, you only shoot if it's legitimate defense, and then you have to prove you were acting in legitimate defense. Imagine the French marched toward the Swiss border with guns, bombs, burned tires and equipment to dismantle border control. You wouldn't call the Swiss terrorists for shooting at French invaders, would you? If Palestinians show restraint and renounce violence, they will probably get a state. But they want to conquer Israel, not get a state within any borders. And they want to parade at the UN once they conquered Israel, chanting that they defeated the unsinkable Jews, and get all the respect for that. 9 - Borders used to be open, but then Palestinians were blowing themselves up in Israeli buses, so the Israelis decided to build fences and circle the area. In the past there were no walls or fences in many places and Palestinians could technically end up in Israel, but after a wave of terrorist attacks, Israel made sure that no stone was left unturned in border crossings between Israel and Palestinian territories. The only place Israrlis and Palestinians meet freely is at check points, and Palestinians do occasionally ram their cars on soldiers. That's not wanting peaceful cohabitation with an Israeli state.